Low-income New Yorkers are relying on unregulated rentals in increasing numbers, and losing the rent and tenure protections provided in the regulated and subsidized housing sectors. They are increasingly vulnerable to sudden rent increases, do not have a right to a lease renewal, and are thus more susceptible to displacement, eviction, and homelessness. As competition for scarce housing with reasonable rents intensifies, low-income tenants are more vulnerable to substantial risks across housing sectors. 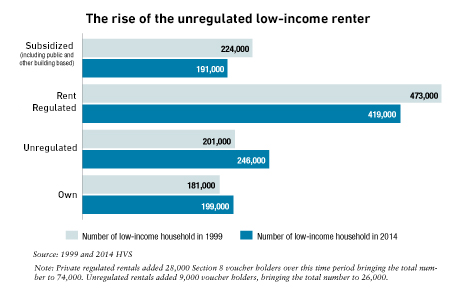 First, as to the decline in low-income New Yorkers in rent-regulated housing: The chart below shows the decreasing number of low-income renters in the regulated stock and in government-assisted housing, and a simultaneous growing reliance on unregulated rentals. The ongoing deregulation of rent-stabilized apartments through high-rent vacancy deregulation and the major loss of subsidized units during the mid-2000s contributed to these long-term trends. The survey also asked low-income New Yorkers about landlord harassment. New York State’s rent laws protect rent-regulated tenants from unexpected rent hikes. However, many rent-regulated tenants face harassment from landlords, a form of housing insecurity that includes any actions that intend to force tenants to move out from their apartments, so they can then be rented for higher rents. Long delays in making necessary repairs. Had the heat or hot water cut off. Problems caused by prolonged construction, like excessive debris, dust, and blocked entrances. Had landlord bring you or other household member to court to try to evict you. Threats from your landlord or super, such as late-night calls, letters, or repeated visits. Repeated efforts by your landlord to pay you to move out of your apartment." To measure harassment, we combined those six tactics into one index. Strikingly, we found that 41 percent of low-income renters experienced at least one type of harassment. A significant percentage of both regulated (22 percent) and unregulated (17 percent) renters experienced two or more types. Regulated tenants were more vulnerable: as illustrated in the chart below, the share reporting at least one form of harassment was eight percentage points higher than unregulated tenants. This confirms a pattern that organizers have pointed to repeatedly: landlords use harassment as a strategy to push out rent-regulated tenants. Tenant turnover is profitable for landlords because each new rent-stabilized lease qualifies for a “vacancy bonus”: a 20 percent rent increase. Further, when the rent in a vacant rent-stabilized unit reaches $2,733, it is permanently deregulated. Systematized harassment is particularly pervasive in buildings owned by predatory equity landlords, who make speculative investments in modest rental buildings with a stated goal of exploiting the rent gap between actual and potential rents through rent hikes and service cuts. Oksana Mironova is a housing policy analyst at the Community Service Society. Victor Bach has been senior housing policy analyst at the Community Service Society since 1983. 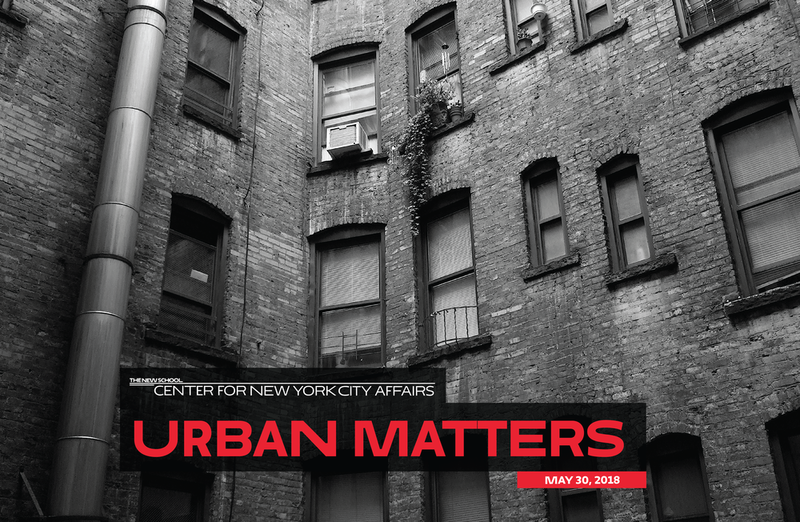 This Urban Matters is adapted from their April 2018 report Tenants on the Edge.